Hey there! 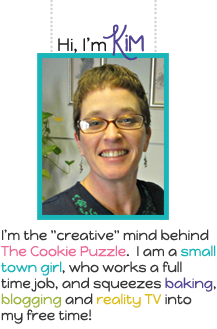 I'm Jennifer and I blog over at Not Your Momma's Cookie. I like making a little of everything, from decorated sugar cookies to cupcakes and more. I was so honored that Kim asked me to participate in this wonderful and meaningful project. Autism, to me, has never felt like real. It was a word. It was on the news, in books and magazines, and in stories I had read. I knew what it was, in technical terms, but I had never met anyone with autism. It was something that I knew existed, but it had never truly touched my life. It is a word shrouded in fear. Expectant parents hope that their child doesn't have it. Studies attempt to tell us what causes it. Parents grasp at any explanation to explain why their child has it, why them? But, in reality, we know very little about it. This lack of understanding, this lack of a magic formula that says THIS + THAT = austism, is positively frightening. It is a word that represents many different types of people. The autism spectrum is wide and all-encompassing. From Asperger's to "pervasive developmental disorder not otherwise specified," it is a murky world of the hard to define. At its core, to an outsider, autism is "otherness." It's not me, it's something else. Someone else. It is outside of my bubble of a world, along with other scary words that do not affect me on a daily basis. This is wrong. To anyone who thinks that autism has never touched their life, I ask, "are you sure?" Was it the little boy throwing a temper tantrum in a restaurant, while others gave dirty looks? Was it a lady who you tried to start a polite conversation with in line at the grocery store who ignored you? Was it a child screaming on an airplane? We make assumptions constantly about the people we see everyday. Those parents need to do a better job disciplining that little boy. That lady was rude. I wish that child would be quiet on the plane so I can sleep. We have all done it. But, perhaps, the world is already too full of the undefined, the scary, the others. It is the world we create around ourselves, pushing other people into categories, "I" am not like "them." Instead, why don't we all try to bring more kindness and understanding into the world? The tiniest piece of kindness can make a tremendous difference (like this story). To me, these cupcakes represent the fact that there is more to everyone than what you see, what you perceive. They represent the "others," beautiful children who are frequently misunderstood, who cannot always express themselves in a socially acceptable way. They are deserving of kindness, of patience, of acceptance. Because they are not truly "others." They are just like you and me. Beautiful words Jennifer, and perfect cupcakes! Super cool cupcakes, Jennifer, and a touching post! Fantastic post! I love the cupcakes. So creative! OMG.. LOVE the cupcakes.. came out WAY better than my puzzle cake. I figured out that i ended up places my puzzles the WRONG way on the bottom layer so everytime I cut a slice I was cutting my puzzle in half. Oops. Yours are so cute!!!! Love the post.. great job..
Great post Jennifer! Thank you for the reminder to be less judgmental and more accepting. 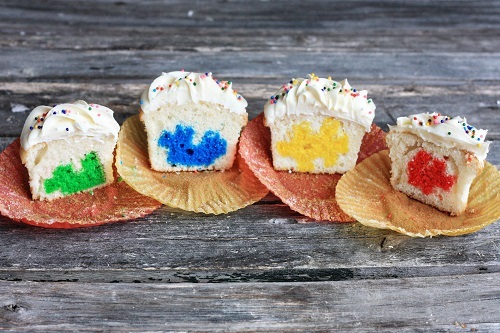 You are clever clever cupcake baker! These are fantastic. What a wonderful post! What a creative surprise in the center of a cupcake. Love this! !